I had the pleasure to design and direct this TVc campaign from Rolex. Using, a mix of 2d technical drawing and 3d camera mapping. Each film illustrate the specificities of one of the Iconic model from the crown brand. The attention to details that needed to be put in each of these films to meet Rolex expectations was astonishing. And I have the outmost respect for the craftmanship and creativity that Rolex as brought to the game. Fun fact; Rolex team watched the films frame by frame to make sure that every gear, hairspin, case, font... was acuratly represented. Once the storyboard was validated I would produce a set of 4 Styleframes for each film, trying to set up the key shots while preserving a coherence within the campaign. The Datejust is the ultimate ‪Rolex‬‬‬‬‬ classic. Introduced in 1945, it was the world's first self-winding wristwatch chronometer to display the date in a window on the dial, and the first Rolex equipped with the distinctive Cyclops lens over the date for easy reading. The Rolex Explorer embodies the spirit of adventure and the perseverance that lies behind every exploit. 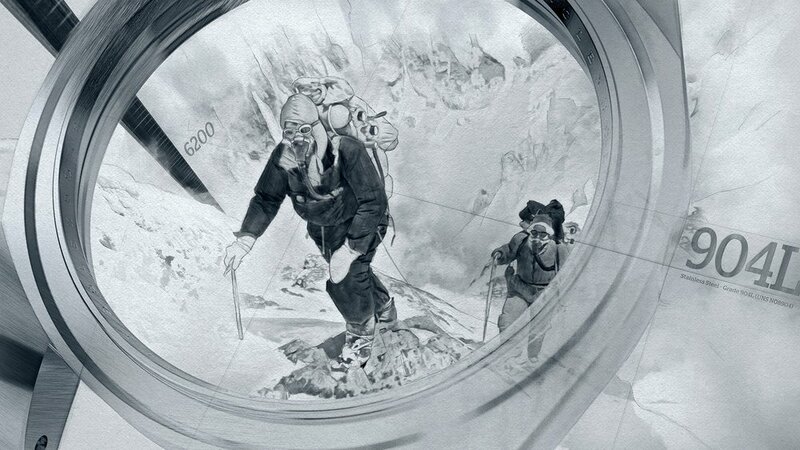 On 29 May 1953, Rolex Oyster watches equipped the expedition of Sir Edmund Hillary and Tenzing Norgay, the first men to reach Everest's 8,848-metre summit and stand on the top of the world. The Rolex Daytona is an iconic chronograph that was born to race. Named after a legendary beach and speedway in Florida, it features a tachymetric scale on the bezel to measure speed and is powered by calibre 4130, Rolex's high-performance mechanical chronograph movement. The Rolex Way. The Rolex Milgauss was engineered for scientists working to uncover the mysteries of the universe. It was developed in 1956 as a pioneering anti-magnetic watch to safeguard its precision against strong magnetic fields. Featuring a lightning bolt seconds hand and a unique green sapphire crystal, the Milgauss synthesizes ingenious design with irresistible style. The Pearlmaster is Rolex's crowning jewellery watch. Only available in 18 ct yellow, white or Everose gold, it is distinguished by uniquely rich dials and exquisite gem-settings of diamonds, sapphires or rubies. A stunning combination of performance and elegance. The Rolex Way. The Day-Date 40 is the new generation of #Rolex's most prestigious model. It features a redesigned 40 mm case and a new mechanical movement, calibre 3255, integrating 14 patents for superlative performance. Only available in 950 platinum or 18 ct gold, the Day-Date 40 stands more than ever as an international symbol of achievement and success.